No country on earth is more preoccupied or has a greater fear of and aversion to dietary fat than the United States. Yet Americans are more overweight than any other country.� A perfect companion to the trade book by the same name, the Maximum Fat Loss Workbook shows readers why high-carb/low-fat diets don't work-and what does. 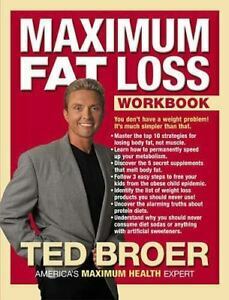 In this workbook, Ted Broer will guide readers through a step-by step process allowing�them to not only lose weight-but lose fat and be healthy. Readers will learn practical applications that will teach them how to easily maintain muscle mass while increasing their metabolism and decreasing body fat.